We Need Foster Homes to Help Us Save More Animals! Please contact us if you can provide a temporary home for a stray. If you are looking for a new family member, we have four-legged friends looking for forever homes! Please contact us for more information and photos of our dogs. 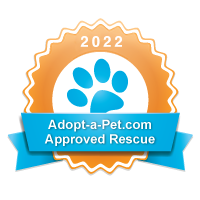 We require potential adopters fill out an adoption contract and we perform a home check. We ask that all members of the family (including furry ones) be present to meet the pet. If you currently have a dog they must be spayed/neutered and up to date on vaccinations. Our adoption fees are $100-$300 for dogs and $50-$100 for cats, depending on the age and medical expenditures..
Sparky is still waiting for his furever family! He is a very sweet young dog. We saved Sparky from a high-kill shelter where he was in pain from a leg injury. He had a successful FHO surgery and can now run and jump pain free. Sparky loves people and is great with children! Please contact us to meet Sparky! Noodles was found at 3 months old wandering around a horse ranch with nothing to eat. Now re-named Lyla, she found her forever home with father and son Barry and Adam. Despite her rough start, she now has a lifetime of love ahead of her! Gilby was found wandering the streets of Miami. He is sweet and playful and gets along with cats and dogs. This adorable Husky-mix will now have a warm bed to sleep in at night! This friendly guy was found on the streets and spent a long time looking for a forever home. He is now happily hiking the woods with his dad and spending his time by the lake! Annie's mother wanted to adopt a calico kitten but Annie couldn't resist the kitten that curled up in her lap for a nap! Two kittens now have a wonderful new home with their fur-moms! Pepper, an adorable 9 month Yorkie-mix, was searching for a forever home so she could give her kisses to someone. We are happy to see the love shared between her and her new mom Nicole. We wish you both a lifetime of snuggling together! Olivia is going home for the holidays! Olivia is a 2 year old Olde English Bulldog and an absolute sweetheart! Sweet Olivia has severe hip dysplasia but will now be cared for by her forever family. Legacie's foster-to-adopt mom made her addition to the family official! Legacie had been living on the streets for months with another dog. We were able to gain her trust and rescue her. Legacie now has a forever home. Mami, now known as Ginger, was adopted by a wonderful family who understands the patience she will need to continue to come out of her shell. Ginger holds a special place in our hearts. She was left when her owners moved. She lived under the abandoned house and had a litter of puppies. Her puppies found their forever home and now Ginger has that second chance. Ginger was once afraid of people but with love has learned to trust people. Faith was found on the streets and while it took this sweet girl some time to feel safe, she is now playful and friendly. She was adopted by a loving family and now has a fur-brother that looks like her twin! Tarpon is one lucky guy! He was found by the Miami river, too weak to move. He had a severe ear and eye infection but was treated back to health. This sweet boy was patiently waiting for his forever family, when Scott and Yonah (who adopted Kanie from Save the Strays Foundation) decided to add to their family! Tarpon is now enjoying life with his fur sister and wonderful parents! Minon was surrendered by his owner, who could not afford the cost of a puppy. This adorable fellow is now in an active home where he will receive all of the love and care he needs! Exactly 1 month after being rescued from under an abandoned house, Cho was adopted! He was the last of his litter mates to find his forever home...but that is because he was waiting for the perfect family! Cho's human aunt shares his birthday, and his new mother's birthday is the date he was rescued! He now has a big yard to grow and play in. Congratulations Cho and family! Zena, was the last of the puppies to be rescued. She was scared when her brothers and sister were rescued and ran back under the abandoned house. We were able to rescue her a week later. Zena, now named Lola, has traded her days under a dark house, to sunny days on a paddleboard with her new mom! Zorro, after a full day of adventure! Zorro instantly loved to cuddle from the first moment he saw humans. He now has a forever family with not only humans to cuddle with, but two fur siblings! Zorro, went from living under an abandoned house to flying in first class to his home in New Jersey! Maxine, was the first puppy to make her way from under the abandoned house and up to us! She has a curious and playful personality! When her new mom saw her, Maxie remined her so much of her dog that recently passed away that she flew Maxine up to New Jersey to live with her and fur-sister Faith. Maxine instantly loved her new mom and sister...and has gotten use to that cold, white thing on the ground called snow! Mia's new family was stricken with grief when their fur-baby passed away. It took some time for them to heal, but when they saw Mia, they felt an instant connection. They knew they were ready to open their hearts, and home, to save this puppy! When her mother was pregnant, she was tied to the front of a store in Downtown Miami and abandoned. The wonderful owners of Animal Crackers, took the mother in and cared for her through the remainder of her pregnancy. "Wrinkles" was adopted when she was 3 months old and her family was very excited to have their first fur baby! This sweetheart loves to be loved. Baby is happy when her new family is nearby. She was rescued from the shelter and is spayed and house-trained. She is a terrier-mix, 6 years old and 18lb. Baby is happy as can be with her new human parents and siblings! Shia, is a sweet 3 year old 45 lb Boxer-mix. Her previous guardian passed away suddenly and it was discovered that Shia had heartworm. She underwent treatment and became healthy. Shia was skittish around sudden movements but was gaining confidence. She shines when she is around other dogs and loves to play. Who could resist her boxer pout? Not Shia's new family! She is now in a loving home and has a big (110 lb!) brother to play with. When Zoey's new mom first saw her on Save the Strays Foundation's Petfinder page, she was instantly reminded of her beloved Lab that recently passed away. Zoey, who was found as a stray, is a well-behaved and affectionate 5 year old small yellow Lab. Zoey enjoyed a 3 hour scenic car ride to her new home with her loving mom and new brother, a chocolate Lab. Congratulations Zoey and family! When Save the Strays Foundation first saw Kanie, she resembled our adopted family dog who lost her battle with Lymphoma just two weeks prior so much that we knew we had to give her a chance to be loved! Kanie was left at Miami-Dade Animal Services by a fellow who said he had her since she was a puppy - yet never gave her a name! Alone and afraid, MDAS listed Kanie as "fearful" and placed her in a back kennel where she was not making eye contact with anyone. We learned that she was heartworm positive and knew she would be put down soon if we did not rescue her. Once out of the shelter, Kanie was a sweet dog and responding well to her treatment. We are so thankful for the newly engaged couple, Scott and Yonah, who adopted her and committed to continuing her treatments. Kanie instantly became excited when she first saw them - she knew she would be save and loved forever! Congratulations to the new family! Cookie is a loving 6 month old 30 pound Boxer puppy who was left at animal services. Despite being abandoned, she was friendly with a funny personality. She loved people...and looking at herself in the mirror. After their dog of 13 years,Terry, recently passed away, his family wanted to honor him by sharing the love they had for him. They passed on that love by saving the life of another dog, Cookie. Thank you for opening your hearts and home to Cookie in honor of Terry! On June 12, 2013, we saved Cooper from death at Miami-Dade Animal Services. Cooper was close to euthanasia as he was found as stray puppy on June 6th and running out of time to be adopted. He underwent treatment for Demodex (mange), and his fur grew back beautifully. Cooper's foster mom was wonderful, making sure he received all of his treatments, and plenty of love, to help him recooperate. Cooper loved to play with his 75 pound Lab foster sister and soon his foster mom realized they had become a family. We lost a great foster mom because she is giving him a forever home. Thank you Heather (and big sis Bailey) for adopting Cooper James! Munchkin, a 3 year old Shih Tzu, came to us as an owner surrender. Sadly, his family simply did not want him any more. Despite losing the only family he ever knew, Munchkin was sweet and affectionate. We are happy that Munchkin now has the family he deserves! Buddy holds a special place in our hearts, as he is our first rescued dog. Buddy came to Save the Strays as an abandoned dog located near railroad tracks in Hialeah. He was malnourished, flea-bitten with worms, and afraid. He quickly learned to trust and shared his love and energy freely. As a young American Bulldog, Buddy needed a home with a caring guardian. David had been thinking about adopting a dog and researching the responsibility. He fell in love when he saw Buddy and it was instantly a perfect match. Thank you David for giving Buddy a loving, forever home!